# Brush the bases of six 250ml soufflé dishes with the softened butter then, using upward strokes, brush the sides. Chill until set, then repeat. Sprinkle dishes with sugar, knock out any excess, then chill again until needed. # Preheat oven to 150°C. Place crème patisserie in a medium bowl and whisk in the passionfruit pulp and whipped cream. Place eggwhite in a separate bowl, add a pinch of cream of tartar and beat until stiff, then beat in the caster sugar. Mix a little of the eggwhite mixture into the passionfruit mixture, then use a rubber spatula or large metal spoon to gently fold in the remaining eggwhites. 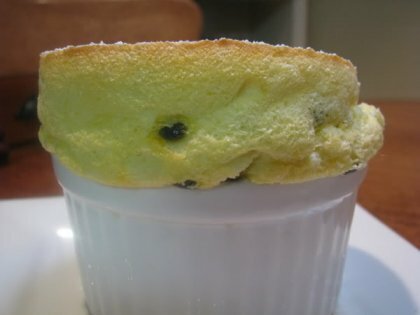 Fill soufflé moulds to the rim and gently flatten the top with a spatula or knife. Place moulds on a baking tray in the oven. After 5 minutes, increase oven temperature to 200°C. Cook for 12-18 minutes, or until risen and golden. Dust with icing sugar and serve immediately. # Place milk and vanilla in a medium saucepan and bring to the boil. Meanwhile, in a medium bowl, whisk together the egg yolks and sugar for about 4 minutes. Then mix in flour but don’t overmix. Slowly pour hot milk onto the egg mixture, whisking well. Return to the pan over medium heat and cook, whisking constantly, until it takes on a thick custard consistency (this should only take a few minutes). Transfer to a bowl and whish for a few seconds to make it smooth. Set aside to cool, then cover with plastic wrap and refrigerate.